THE Coomakista Pass offers magnificent views over Kenmare Bay, Derrynane Harbour, Scariff and Deenish Islands. It is an incredible place to just stop and soak in the views and must be one of the most photographed locations in Ireland. Its descent into Caherdaniel is stunning and, once there, take time to enjoy the many offerings of the village and Derrynane. Caherdaniel parish begins in the wonderful valley of Glenmore with its beautiful lakes and rivers and is world famous for fishing. Caherdaniel Village, on the old butter road, with its stone fort nearby, is an old village right in the heart of the Kerry Way. Full of character and atmosphere, this pretty village stands on the shore of Derrynane Bay. Home to the 'Liberator' Daniel O'Connell, Derrynane House & National Park is a visit not to be missed. Derrynane is one of the most alluring locations in Ireland. The terrain varies from rugged shorelines to gently rolling mountains. The sheltered harbour of Derrynane was once the haunt of pirates and buccaneers and the area still offers adventure with the opportunity to enjoy some of the most beautiful scenery and walks imaginable. The Derrynane National Park covers an area of 320 acres and includes a nature trail, over 1.5km of shoreline and a stunning beach. Derrynane Bird Sanctuary has swans, herons, wild duck, kingfishers, brent geese, storm petrels, kittiwakes and much more by way of interesting birdlife. Visitors can also take the Derrynane Nature Trail through the beaches and dunes. Enjoy it slowly to enjoy the wildlife, passing the Mass Rock and Smugglers Viewing Point. Caherdaniel is a base for many activities - swimming, windsurfing, canoeing, sailing, water skiing, horse riding and angling. From Caherdaniel, the Ring continues on to Castlecove, a rural coastal village that offers lots of activities and events. It has fine sandy beaches and the coastline has created natural rock pools with exquisite sandy coves dotted underneath the cliffs. The imposing ruins of Staigue Fort are close by and are probably the finest example of a stone fort in Ireland from about 2,500 years old. With the mountains to the left and Kenmare Bay to the right, the beautiful drive from Castlecove to Sneem offers panoramic views. Sneem village, is set around the Sneem river estuary which flows into Kenmare Bay. Its shores are lapped by the mild currents of the gulf stream, giving rise to subtropical vegetation on the islands in the estuary. Its sheltered oysterbed harbour offers a safe haven for yachting enthusiasts. Sneem has been the winner of several national Tidy Towns awards and its unique features include the old stone bridge, which is the narrowest part of the Ring of Kerry. Its restful and relaxed atmosphere has been enjoyed by many famous visitors such as George Bernard Shaw, Charles de Gaulle and a host of others. Visit the unique Sculpture Garden and the lovely Garden of the Senses. Sneem offers a host of activities, both in the village and in surrounding areas. These include sea kayaking around Oyster Bay and the Parknasilla Islands (watch out for seals, herons, cormorants and oyster catchers), sailing, wind surfing, deep sea and river angling, cycling, golf, horse riding and, of course, walking. Walking and hiking are a huge part of the great outdoors here. There is a spectacular choice of gentle or rugged routes to choose from with everything from short trails to four-day treks. The Kerry Geopark is also a feature of this region with its outstanding landscape of major geological, ecological, archaeological, historical and cultural interest. The area is of international significance and is cared for and managed by the community. From Sneem, the Ring of Kerry offers a choice of routes: The eastern road to Kenmare or northwards towards Killarney. Taking the Kenmare road (driving or walking), you will visit the dormant 19th century village of Tahilla, which, in its day, was a busy fishing community. Further along, Blackwater Bridge is a small community divided by the river Blackwater, which is a fine river for salmon fishing. The river is managed and with the end of driftnet fishing, wild salmon stocks are growing steadily. 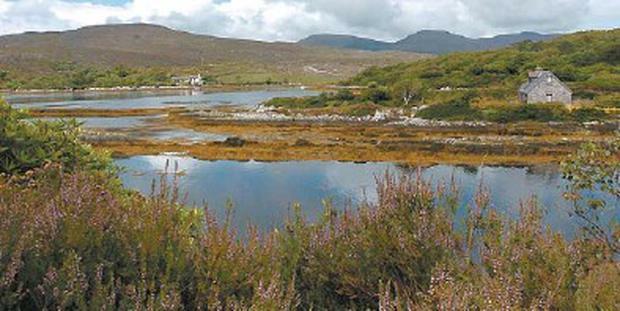 Lough Brin offers brown trout and the Blackwater area offers fine walks and views, golf, horse riding and trekking. Coss Strand beach and Blackwater pier are where fresh bay fish and shellfish are landed. This road brings you along to Templenoe or 'New Church', located on the shores of Kenmare Bay, where the ruins of the ancient castle of Dunkerron lie. The Kerry Way rambles through the village and other activities locally include golf, horse riding and fishing. Taking the northern route (R568) from Sneem towards Moll's Gap, visitors will be amazed by the sweeping valleys and mountain views of this glorious drive. Some of the activities available in the area include horse riding, treks, pony camps, mountain biking, kayaking, fishing, archery, rock climbing, raft building, orienteering and even mud surfing. For the road less travelled, follow the signs for Ballagh Beama Pass and you will be enthralled by this wonderful winding route to Glencar. Just before Moll's Gap, visit Pancake Cottage (over 200 years old) for a homemade pancake – it also has a playground for under 14s. From Moll's Gap, the views are quite spectacular over Killarney National Park and the McGillycuddy Reeks. Take a ramble into the awesome Black Valley and be prepared for the wow factor the deeper in you venture. Alternatively, enjoy the magnificent backdrop of Moll's Gap at Kissane's Sheep Farm where you can 'adopt a sheep' and help preserve the Irish heritage of mountain sheep. You can also enjoy sheepdog and sheep shearing demonstrations, marked mountain walks, a puzzle walk and treasure trail or you can cuddle and bottle feed the pet lambs. Go Kerry welcomes new members, see www.gokerry.ie for details.